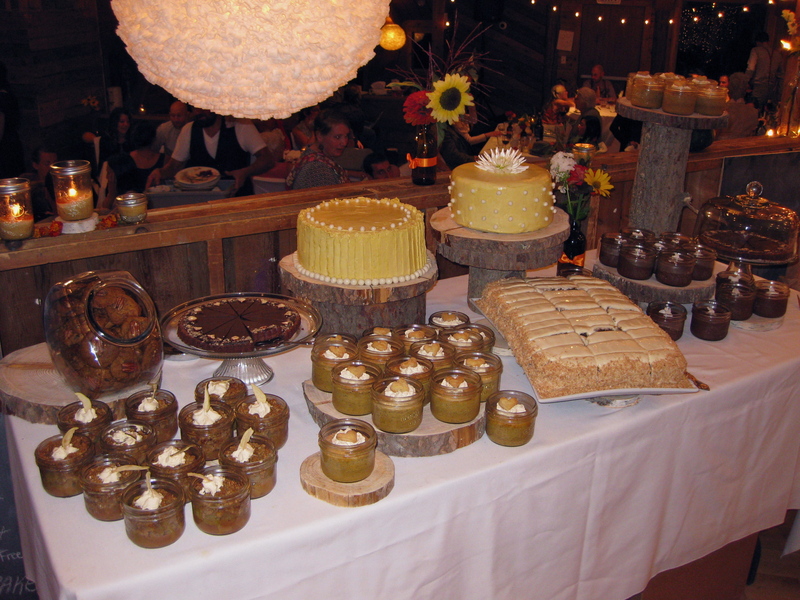 harvest wedding desserts | eating with S.O.L.E. 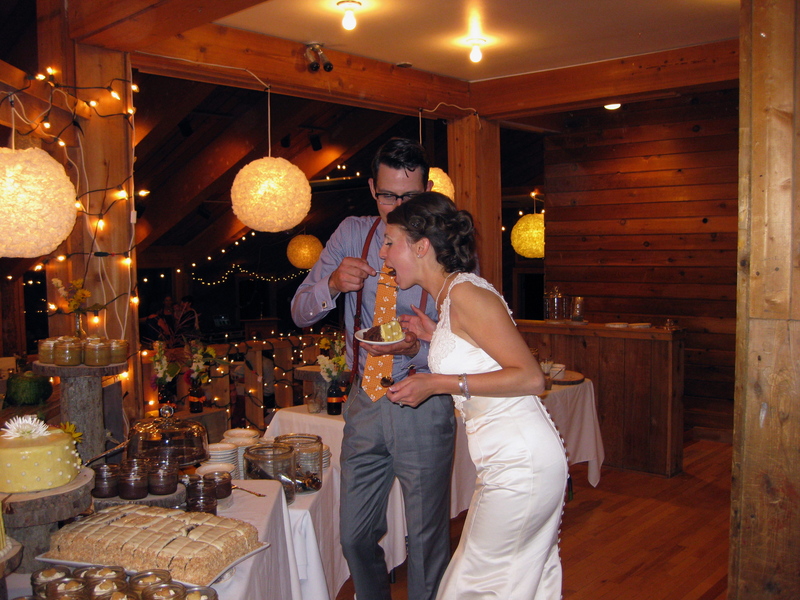 Please excuse my absence over the past while, our friends equinox country wedding has taken over my culinary life for a time. 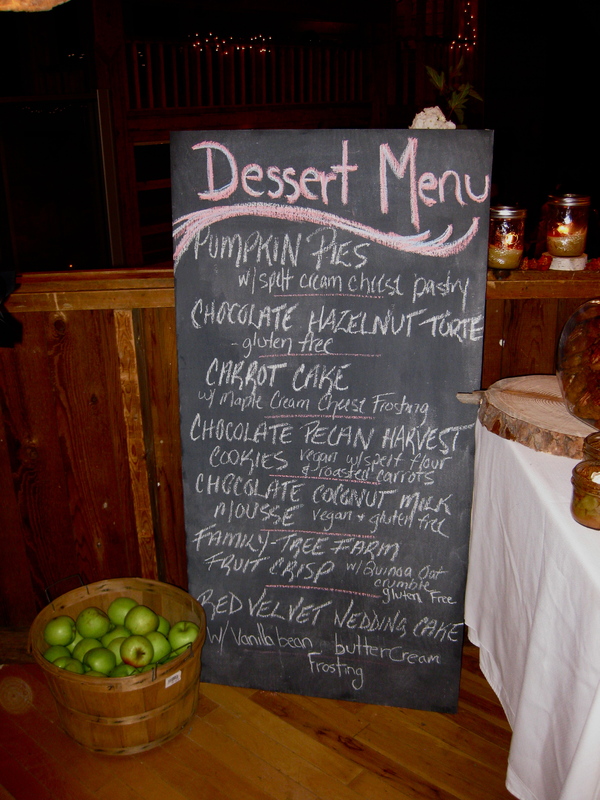 I had the great pleasure of baking all of the desserts for their local harvest feast, along with the wedding cake, and some lovely condiments to go along with the exceptional charcuterie table, whole hog roast and the stunning seasonal dinner Chris Cho of Ayden Kitchan and Bar rolled. I made 4L of bacon Jam, 8L of killer BBQ sauce, and 4L of our favorite brown ale grainy mustard. The wedding cake was two separate two layer red velvet cakes (colored with beet root powder), finished with a lovely old fashioned french butter cream, my friend Peggy taught me how to make, and showed me how to sculpt. She also taught me how to make a crazy not sooo gross fondant made with marshmallow and vanilla beans. For dessert in two short days I created dozens of: little potted jam jars of that lovely pumpkin pie recipe I lean on with a spelt puff pastry crust, vegan coconut milk chocolate mousses also in lovely little jam jars, fruit crisp made with the couples own apples and pears finished with a gluten free toasted quinoa flour and oat crumble, I made a huge two layer slab variation of this carrot cake (my most favorite recipe ever) finished with maple cream cheese frosting, I also busted out a big batch of my killer vegan carrot pow cookies and a couple of my gluten free goto chocolate hazelnut tortes The whole dessert menu was a celebration of local abundant harvest and catered to all dietary needs while still being truly indulgent! So that is my excuse for my absence, and now I am back and playing mega canning catch up! Today I am processing salsa and ketchup, then pickled carrots, and Carols killer chutney… ‘oh happy harvest season.